Official MoD Statement: Air Chief Marshal Arup Raha took over the command of the Indian Air Force as the 24th Chief of the Air Staff at Air Headquarters, Vayu Bhawan today. In his address to the IAF, Air Chief Marshal Raha said, “I feel honoured and privileged to have been entrusted with the responsibility to lead one of the finest Air Forces in the world. IAF is on a trajectory of modernisation and is transforming into a strategic aerospace power with full spectrum capability. Accretion through new acquisitions, replacement of obsolete equipment with state-of-the-art inductions and upgrade of the vintage weapon platforms would bolster our capabilities. In-depth knowledge, proficiency and professional competence to harness the potential of new equipment would provide the necessary cutting edge in discharging our onerous tasks. In this strategic transformation process I expect sustained effort and special attention from all air warriors to maintain high operational status of the legacy equipment, while operationalising the new inductions in a time bound manner. This would obviously be achieved through exemplary leadership at all levels of the IAF. Our air warriors displayed exceptional dedication and commitment during ‘Op Rahat’ in Uttarakhand, the largest ever Humanitarian Assistance and Disaster Relief helicopter operations, rescuing thousands of people and saving precious lives. A record 3702 sorties were flown while 24,260 people were airlifted to safety, despite the challenges imposed by inclement weather, difficult terrain, high altitude and unprepared helipads. Our professionalism and grit has earned accolades from all quarters, not only in India but from abroad as well. High operational preparedness and successful conduct of various exercises in India and abroad have reinforced our professional reputation as a formidable force. We need to continue to work with great synergy and vigour in meeting all challenging tasks during the year ahead. IAF is committed to providing vital support for our security forces deployed in Counter-Insurgency Operations. Sustained efforts in air maintenance in the Northern and Eastern sectors are being appreciated by the Military, Para-military, Central agencies and state authorities. Our people are our most valuable assets. A strong, motivated and cohesive team is the key to our success. I exhort all air warriors to follow the fine traditions of this great service and ensure that we ‘Touch the Sky with Glory." Commissioned into the Flying Branch of the IAF in Dec 1974, Air Chief Marshal Raha graduated from the National Defence Academy(NDA), Pune with the President’s Gold Medal in 1973. An experienced Qualified Flying Instructor (QFI) holding ‘A2’ instructional category, Air Chief Marshal Raha, has served as a Directing Staff at Flying Instructors School(FIS), Tambaram as well as at the Tactics and Combat Development Establishment (TACDE) of the IAF and has to his credit nearly 3,400 hours of flying experience, mainly on fighter aircraft. An alumnus of Defence Services Staff College(DSSC) and the National Defence College, New Delhi, he has functioned as an inspector in the Directorate of Air Staff Inspection in Air Headquarters and as Staff Officer to the Chief of the Air Staff. 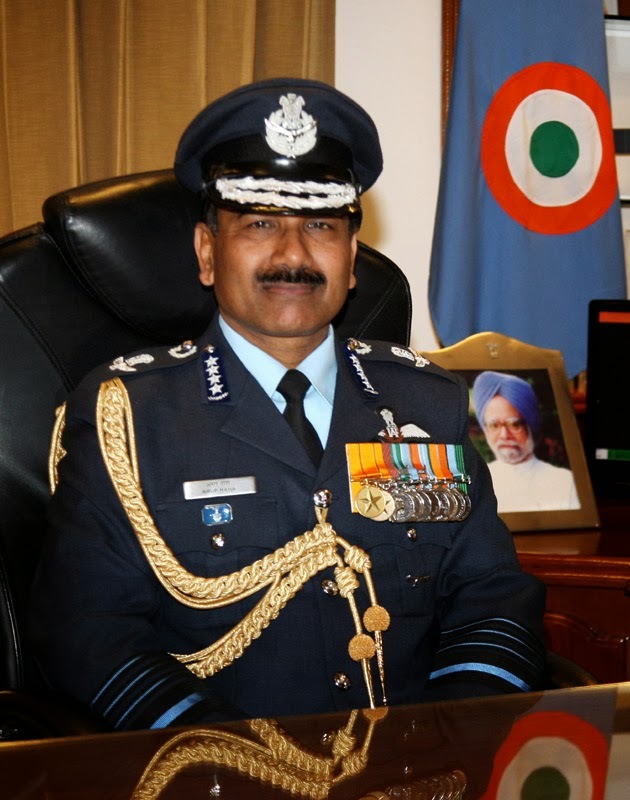 He was deputed as the Military and Air Attache in the Embassy of India, Kyiv, Ukraine from 1999 to 2001 and has held many operational assignments such as Command of a MiG-29 Squadron, Bhatinda in Punjab during ‘OP PARAKRAM’, Adampur and Advance Headquarters Western Air Command, Chandimandir. He has also served as the Deputy Commandant at the Air Force Academy, Dundigal,Hyderabad, Senior Air Staff Officer (SASO) at Headquarters Western Air Command and Air Officer Commanding-in-Chief, Central Air Command(CAC)and Western Air Command(WAC). He took over as the Vice Chief of the Air Staff(VCAS) on 01 Jul 2013. Air Chief Marshal Raha is a recipient of Param Vishisht Seva Medal, Ati Vishisht Seva Medal and Vayu Sena Medal. He was appointed as Honourary Aide De Camp (Air) to the Hon’ble President of India wef 01 Dec 2012. He is married to Mrs Lily Raha and has two children. He is an avid reader and a keen golfer who enjoys travelling.